Obama goes out on a limb for slim Jim Kim. It’s no whim. 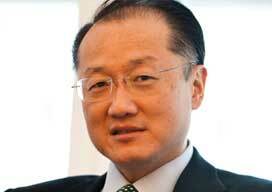 President Obama has nominated someone with the unlikely name of Jim Kim for the presidency of the World Bank. He’ll get the job because he’s Washington’s man. It’s a shrewd move on Obama’s part, heading off criticism from the developing world that the position always goes to a political appointee. The incumbent, Robert Zoellick, used to be US Trade representative. His short-lived predecessor Paul Wolfowitz was farmed out to the Bank after screwing up playing such a central role in the Iraq war. Kim’s still American, though, so he’s probably going to promote US interests as usual, and he wasn’t selected through a competitive process. That’ll annoy developing world candidates like Nigerian finance minister Ngozi Okonjo-Iweala, and the former finance minister of Colombia, José Antonio Ocampo, not to mention the many activists who’ve campaigned for years for an open selection procedure. It’s a foul anachronism that the International Monetary Fund is always run by a European (currently Christine Lagard) and the World Bank by an American. Proponents say that because the US contributes the most to the Bank’s budget it should get the most votes on the board. But that’s a terrible excuse for the naked manipulation of power. Before the Representation of the People Act 1918 in the UK, which abolished the requirement that you had to own property to vote, people used to argue that the propertyless weren’t responsible enough to be enfranchised. But it’s a fundamental feature of democracy that one person or entity should be allowed to vote irrespective of their wealth — otherwise what you’ve got is not democracy but argentocracy: the rule of money. I don’t agree with the economists quoted in the Financial Times who say that Kim isn’t qualified for the job. Apparenty he’s a doctor, anthropologist and former head of the HIV/AIDS department of the World Health Organisation. In my view it’s a good thing he isn’t an economist, as mainstream economists haven’t proven themselves fit for duty during the crisis and they tend to minsunderstand development, thinking development policy is all about liberalising everything and applying the results of their unrealistic formal models brewed in a Western academic setting. Hopefully Kim will have a much more hands-on approach, and he’ll deal with development in a more human way. It’s also good news that shapeshifter Jeffrey Sachs failed in his campaign for the position, although he was never likely to succeed. I encountered him in his most recent guise in Bhutan last year, where he was holding forth on the economics of happiness. Not so long before he was a guru of environmentalism. Prior to that he proclaimed that the end of poverty would come through massive injections of aid into developing countries, a bit like a modern Marshall plan. And of course he’s best-known for his 1990s forays into eastern Europe and Russia, where he administered near-fatal bouts of shock therapy to several former Communist regimes.